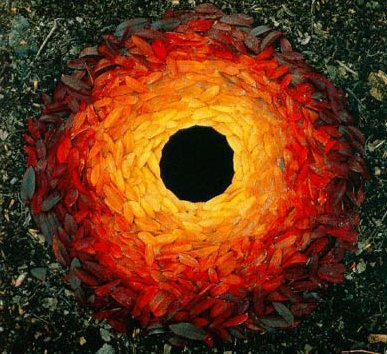 One of the most creative artists in the world, Goldsworthy purposely creates beauty from nature that nature herself will destroy sooner or later and mostly sooner. He is also a photographer, which is essential to document the works of art that sometimes last only moments and sometimes years before they are gone. Working from his home base in Penpont, Scotland, he travels the world interacting with water, stone, and growth to form both small and massive creations that inspire and delight. This beautiful documentation of his work was lovingly created by German writer, director, and cinematographer Thomas Riedelsheimer for Mediopolis and Fernsehproduktion Gmbh with incredible music by Fred Frith. 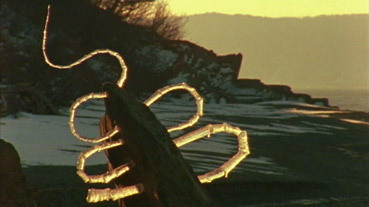 Beginning on the isolated shores of Nova Scotia, Goldsworthy acclimatizes himself by building a twisting line from icicles, bending and shaping them into what appears to be the lazy oxbow of a river, gleaming white in the sun as it slips into and out of a rock on the shoreline, waiting only for the sun to melt it. Riedelsheimer’s camera lingers on the swirls as a river rushes into the sea and the tide moves in to smother it. On another day, Goldsworthy builds a gigantic pine cone from rocks along the shore, but the balance is so delicate that it keeps falling apart and he must start over again. The tide is out, but it will come back in by 3:00 PM so he must work fast to get it finished. There is not enough time, so he must give up. He explains that as he works with the rocks, he gets to know them, to understand how they fit together. On the third day, his giant pine cone stands on the shore and he watches as the tide comes in, completely covering it with sea water, but when the tide goes back out, it is revealed again, still standing. Gathering driftwood, he creates a hemisphere of sticks on the rocks, building and coming together with a perfectly round hole in the top. A man wanders by and the two of the watch as the tide rises, swirling the wood back out into the sea that threw it up on the shore in the first place. At home, in Penpont, he works on a hillside, among the long-haired oxen, pulling reeds from the ground and arranging them on the hill with brilliant bronze points flowing away from a jet black circle in the center. Using thorns, he tacks sticks to the branch of a tree, intersecting them until they form a perfect center in the middle. He wraps leaves tightly around themselves to create a gigantic snail. Working on a commission at Storm King Arts Center in Mountainville, N.Y., Goldsworthy directs workers in the creation of a wall that snakes like a river through the trees, disappearing down into a pond and re-emerging on the other side to continue on. Splashing through a stream, he finds red rocks with a high iron content and breaks them down into dust. He either mixes the dust with water that pools in holes in rocks, creating a blood red circle, or he tosses a ball of the dust into the river, making large, bright red splotches in the stream. Using thorns, he connects a train of leaves that unwinds in the river like a large, green snake. Riedelsheimer’s camera follows him as he makes a huge volume of art, most of it destined for immediate destruction by the world from which it is created. 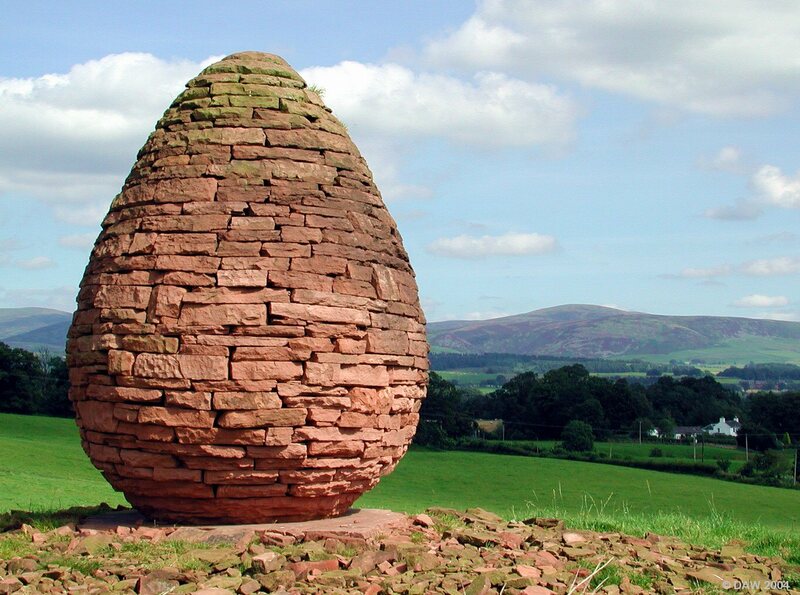 Along the way, Goldsworthy talks about the philosophy of his art and the nature of time and existence. Creation and destruction are obviously at the heart of his work, but the two acts work within a given time. For example, creating his gigantic cone of rocks on the beach before the tide comes in to cover it or listening to the wind as he works on his tree sculpture, knowing that in the space of minute the delicate structure can fall. Nature itself is in a constant rhythm of creation and destruction. 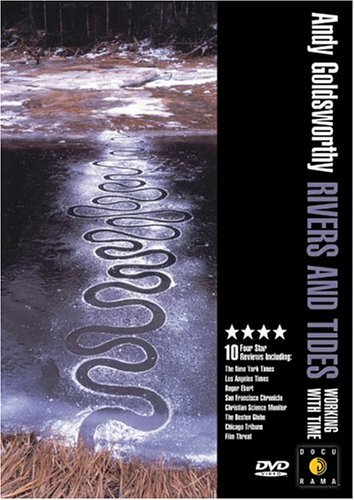 Goldsworthy looks at the example of his iron rock, how it solidified over the eons, how it even now contains the water that runs through everything and how, once pulverized, he can return it to the river as dust, knowing that it will again coalesce in the riverbed. 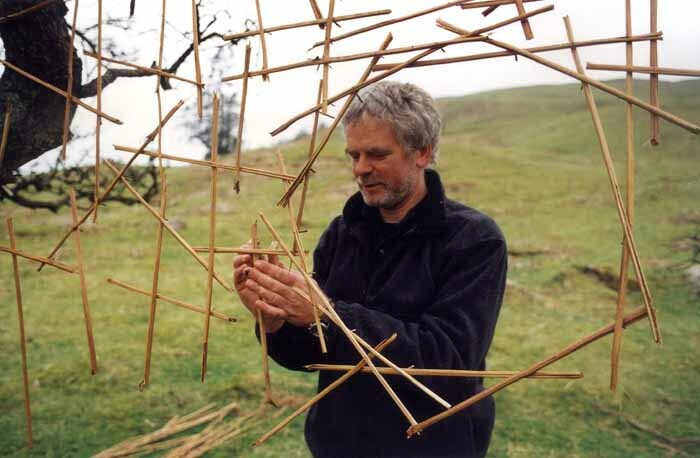 Time is like the images of the river that are a recurring motif in Goldsworthy’s work. It swirls around us constantly from moment to moment, pulling in something here, discarding something there. Existence, like Goldsworthy’s creations, is ephemeral. We are like the river that passes through it. I admit that documentaries have never been my favorite form of film, but recently, due to the influence of my friend, Harlan Heald, I have begun to watch more and more of them, especially films about artists–and this is one of the best, because it is not just about art, but it exists as a work of art in itself. It is a film that I can watch over and over and every time it makes me feel more a part of the natural universe I inhabit. It is a creation of great beauty. The DVD contains two disks. Disk 1 contains the film, plus a number of short films about some of the individual projects, as well as information about Goldsworthy, Riedelsheimer, and the production company. Disk 2 contains a very interesting film about a project where Goldsworthy created 13 gigantic snowballs, each containing a different texture (one contained pine cones and another contained cow hair) that were deposited on various streets throughout London at mid-summer, to melt during the longest day of the year. Riedelsheimer followed the process as well as filming the reaction of a great many Londoners to finding this monstrosities on their streets. It also contains an in-depth interview with Riedelsheimer. This is a DVD that could easily be a part of anyone’s collection as it can be viewed over and over again with enjoyment. The colors a beautiful, the cinematography is wonderful, and the philosophy is very enlightening. 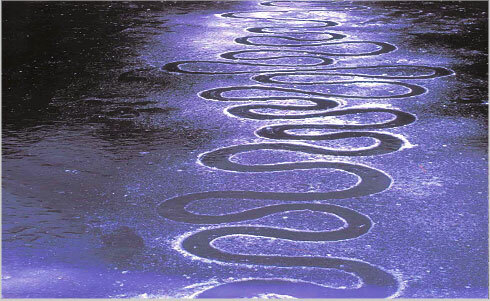 I highly recommend Rivers and Tides: Andy Goldsworthy (Working with Time).